Since 1996, Trex has invented, defined and perfected the composite deck category with a lineup of low-maintenance, high-performance products that fundamentally change the way we live outdoors. IS THE TIMBER GRAIN DEEP? Trex decks will not rot, warp, peel, or be devoured by termites. Period. In fact, while all of our decking and railing products offer a 25-Year Limited Residential Warranty against material defects, our high-performance lines add an additional layer of coverage with our 25-Year Limited Residential Fade and Stain Warranty. Read details on our warranties. We invented the category, but we didn't stop there. That same low-maintenance innovation is available in Trex deck railing, deck lighting, industry-first steel deck framing and more, creating an entire Trex system of outdoor living. Consider it a package deal you can get nowhere else. Visit our Inspiration Gallery to see Trex performance from the ground up. A few of our favorite colours that can be used in hundreds of decking and railing colour combinations. 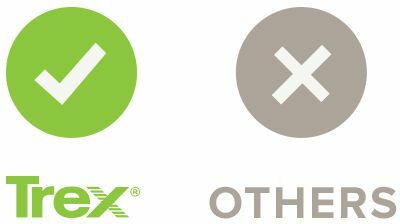 At Trex, decking is comprised of 95% recycled materials—namely, recycled timber, sawdust and plastics. This earth-friendly formula, coupled with groundbreaking green processes, makes it hard to find a company more actively aware of its impact on the environment. Learn more about our earth-friendly processes.